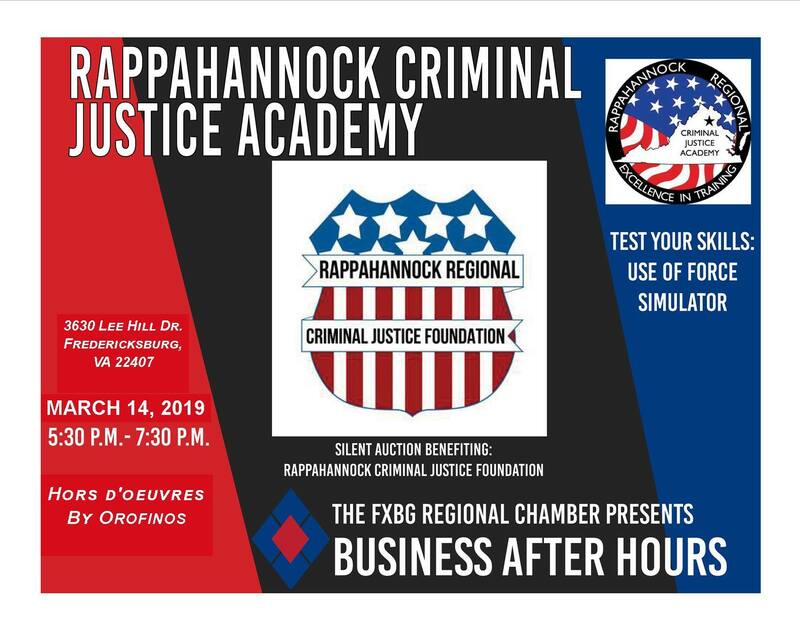 Join us for our March Chamber Mixer as Rappahannock Regional Criminal Justice Academy hosts their third one at the at the academy! Network with other businesses and individuals from the law enforcement community. In addition to networking, the academy non-profit foundation hosts a silent auction to raise money to support the training mission of your local law enforcement officers. In the past they have had gift baskets, law enforcement related items, crafts, and many other items in the auction. They will also hold a 50/50 raffle, Use of Force Simulator, Driving Simulator and food from Orofino's Restaurant! **Please note - non-members are able to attend up to 2 events. Following that, will need to join the Chamber to continue to attend Chamber events. If you'd like to donate to the auction, contact Mike Harvey at 540-371-2875 or at mharvey@rrcja.org.